Not everything that ships through the supply chain winds up on a plate or in a home. Often, the final destination for a pallet of product is the factory floor, the inside of an engine, or the skeleton of a skyscraper. These materials support the industries that put food on our plates and make our lives possible. However, it takes a lot to get these types of products–which are often metal, rock, brick, or concrete–from one place to another. Heavy trucks, hardworking laborers, and industrial-strength pallets are necessary to carry the weight of these products. Yet, despite how heavy many of these items are, basic wood pallets are still commonly used to transport them. Often, wood pallets splinter beneath heavy loads or break outright, wreaking havoc with the tight timetables of industrial logistics. Industrial plastic pallets combine standard pallet dimensions with the strength and durability to carry the substantial loads that heavy industries call for. 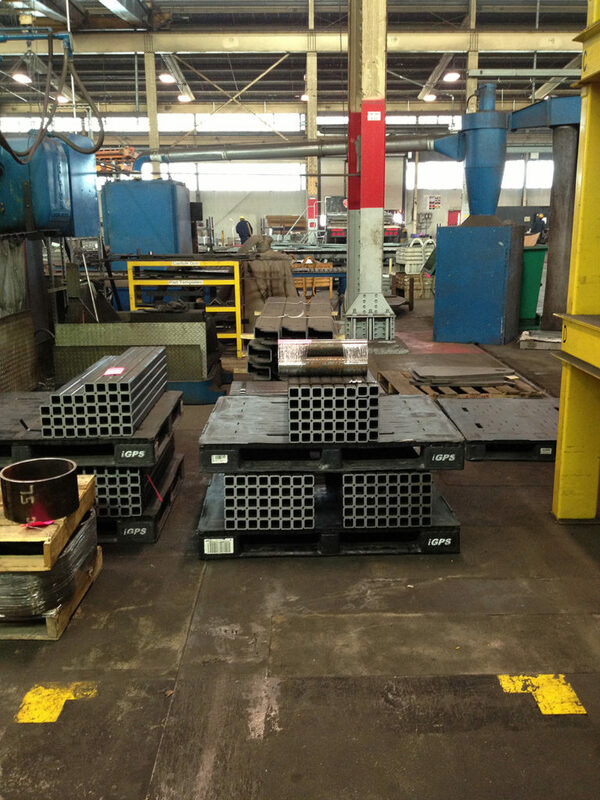 Industrial-strength plastic pallets are a reliable shipping platform for construction materials, machine parts, and other industrial products moving through the supply chain. Wood pallets are by far the most common type of pallet used across supply chains—industrial and otherwise. And while some wood pallets are advertised as being able to support up to 4,800 pounds of weight, not all wood pallets are the same. In the broad category of stringer pallets alone you can find both sturdy versions with full top decks as well as flimsier versions with six widely spaced deck boards. A commonly given number for the maximum dynamic load of a basic wood pallet is 2,000 pounds, but no matter what the load limit is on a wood pallet, it will depend heavily on the condition of the pallet. Both stringer pallets and sturdier wood block pallets degrade quickly over time, resulting in a maximum load that may be smaller than promised. Given that a 40×48-inch load of bricks stacked six feet high weighs in around 3,400 pounds–and products like steel components and automotive parts can weigh even more–using unreliable wood pallets to ship industrial materials can be inefficient, requiring more pallets and therefore more space on the truck. High-quality industrial plastic pallets are far stronger than wood pallets and their strength is more reliable. Non-Absorbent Material: Since plastic doesn’t absorb moisture the way that wood does, the iGPS plastic pallet doesn’t rot and won’t hold moisture on its surface. This keeps the iGPS pallet strong and reduces rusting or corrosion of industrial parts during transit. Improved Hygiene: Plastic surfaces don’t have a grain that grease, grime, or industrial fluids can work their way into, and plastic won’t splinter or create wood debris. This helps prevent chemicals and debris from being spread throughout warehouses, loading docks, and transportation vehicles. Lighter Weight: At less than 50 pounds, a plastic pallet weighs significantly less than a wood block pallet. When a truckload size is limited by the weight of the product, using lighter plastic pallets makes it possible to transport more product in each truckload. Unitized Construction: The iGPS pallet doesn’t use fasteners like nails or screws, removing the possibility of boards working loose over time and loose fasteners finding their way into moving parts or product packaging. Engineered Consistency: iGPS pallets are built to consistent standards to allow tighter margins when pallets are loaded with material or onto trucks. There’s no need to account for variabilities in strength, weight, and dimensions; instead, loads can be calculated exactly to meet job requirements. Succeeding in the industrial sector requires delivering a consistent product on-time and as efficiently as possible. The iGPS platform is an industrial plastic pallet with the strength and the consistency to deliver heavy industrial products without pallet-related interruptions or delays in loading, transportation, or delivery. And when you choose iGPS for your industry, you’re not only choosing a superior pallet, you’re choosing a superior pallet management system as well. Getting the full benefits of durable plastic pallets requires that they are reused, yet many industries find managing the reuse of their pallets difficult. It requires arranging for the pallets to be picked up at the delivery site, transported back to the company’s storage or production facilities, and kept idle until needed again. Managing a pool of reusable pallets often amounts to running a parallel business–with its own supply chain–alongside your actual business. Pallet pooling through iGPS solves this issue by allowing businesses to enjoy the benefits of a high-quality plastic pallet without having to manage their own supply of pallets. iGPS will deliver the required number of industrial plastic pallets by the batch on the specified date and will arrange for their return to the iGPS pallet pool, allowing your company to enjoy all the benefits of a superior shipping platform without the hassle of procuring or managing a supply of pallets. The advantages of the iGPS plastic pallet create efficiencies that lower your Total Cost of Business (TCOB) and add up to substantial savings over time. The iGPS pallet pool offers a plastic pallet strong enough to handle heavy industrial product loads. To switch to a more durable, reliable pallet, give our team a call at 1-800-884-0225, email a specialist at switch@igps.net, or visit our contact page.